An interior french door is a door that has multiple windows set into it, the full length of the door. Traditional french doors are assembled from individual small pieces of glass and mullions. A mullion is a structural element which divides adjacent window units. Interior French doors are becoming more and more popular these days. They really provide a couple of nice qualities besides extra value to your home. French doors allow you to close off a room from the rest of the house, but still allow you to have extra light coming into a room keeping the sense of an open floor plan. There are different varieties and styles to choose from also which may include frosted or clear glass. 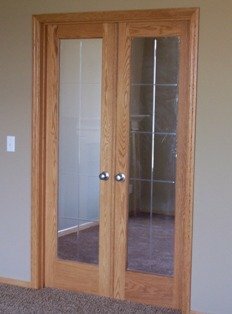 You can also buy these doors with etched designs in the glass and different mullions in the glass which create different sized panels of glass. French doors are not only limited to the interior, there are exterior versions also and do come with all the different variations as mentioned. These exterior french doors are also made of all the same materials as regular exterior doors. This may include wood, vinyl, and steel and also include double paned glass and other features which help the r-value or insulation value of these doors. The installation of an interior french door may seem a little intimidating at first. I remember the first one I installed and yes I was intimidated but once I started it was not that difficult. This job is much easier with another person and really is a two person job although I have installed these doors by myself and it is doable by yourself as long as you have experience with installing doors. 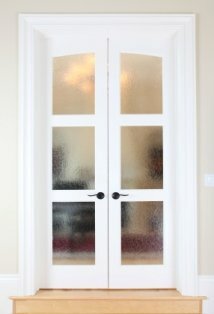 If you have installed interior doors before, this french door will be no problem. A couple of things to watch out for with french doors are to be sure you start out by tacking in firmly, but not permanently, the jamb leg on one side of the door level. Pay attention to the cracks or reveal between the doors and jambs in all places around the door as you work keeping them even and being sure the starting jamb leg remains secure and level. Another problem I have ran into is the two walls on each side of the doors are not in plane and this needs to be addressed early in the process before anything is nailed in permanently. One way I combat this problem is to case the door on the inside before I set it in the opening. Work the door in place tacking it in as you go working from one side to the other and be double checking everything as you go by opening and closing the door being sure the holes for the latch hardware stay lined up and the reveals are staying even. Take your time and once the door is tacked firmly in place it is time to go back and permanently nail and screw it in going through the whole procedure again checking and watching everything as you go. Some extra length screws will be needed and most of the time are provided by the door company for installation. These screws will be installed right at the hinges through the holes of the hinge. I have found that it works best for me to use just two screws on each jamb leg. One at the top hinge and one at the bottom hinge. One thing to watch for when permanently nailing and screwing is the binding of these doors at the hinges. Be sure that the jamb legs are shimmed tightly and the screws are not drawing the jambs to tight which could pull everything out of whack. If this interior french door is the first door you have ever installed then you would definitely need some extra help. An extra pair of hands and eyes will make it easier and be necessary.in Go here installing-interior-doors and read about installing interior doors to at least get an understanding of how basic interior doors are installed and this will help tremendously for installation of a french door. Return From Interior French Door page back to Prehung Interior door page .